The old cliche about a picture and a thousand words has never held more true than at Bli Bli Castle on Queensland’s Sunshine Coast. Snapped by my girlfriend, the T-Rex on the battlements* says it all – if it’s more than 50 years old, we’re just going to jam it all in together and hope you enjoy it. As well as our friend to the right, there is also the alpine railway, a national costumes of the world display with hundreds of identical dolls, as well as a doll museum with thousands of less identical dolls in one big, weird room. Add to that a nativity scene, the throne from Xena, Warrior Princess [this one’s non-historical, but you get the idea] and a display on explorer James Cook. I rest my case. Sunshine Castle had a special brand of magic for me when I was 10. Surely one of the only castles in the world made out of Besser blocks, it is a bit light on for standard features that might be of service in repelling hordes of barbarians – although to be fair, a couple of T-Rexes would probably come in pretty handy. Some of the fairytale dioramas are genuinely terrifying, particularly if there aren’t too many other people around. The girl behind the counter confessed that the first time she was on shift in the evening, she had to flee down the stairs after she turned out the light because she had the eerie feeling something was pursuing her. From the dress-up box by the door to the stocks and the displays – and yes, we took full advantage of all of these on our visit – I simply cannot rate this place high enough. Kids will love it and adults can appreciate it for an entirely different reason. Hey, the dungeon’s actually not too bad. Check out the website for more. *This post was originally written several years ago. 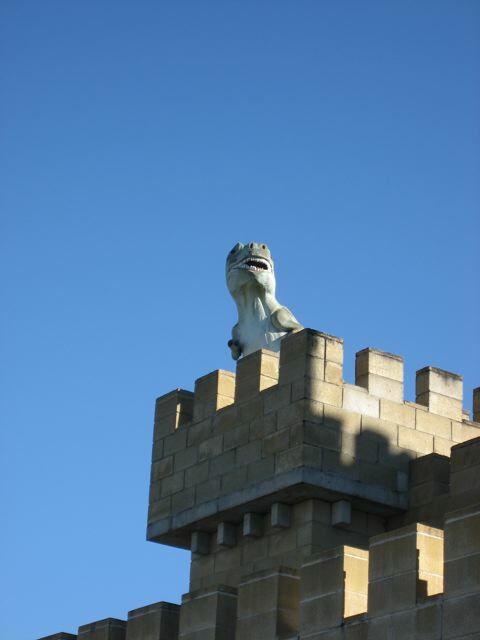 I cannot confirm whether there is still a T-rex on the battlements, but I sincerely hope so.